I am so lucky to have spent the day with Susanna and her friends . First we went to the market to buy food. Then one of her friends, Manuel, picked us up and drove Susanna; her friend, Nasy, and I out into the country to a very small village. We stopped at a wine cellar on the way. Manuel owners a house that was originally built-in the 12th century. The gate to the court-yard. Juan and Manuel bringing up water from the well (but not for drinking). Barbecue where they cooked the fresh sardines that Susanna bought in the market and the ribs. Other friends (Raul, Diana, Juan, and Noeme) arrived and they all brought food. It was a regular Spanish potluck. I feel so privileged to have been there. I felt immersed in Spanish culture. There was no electricity or running water because Manuel is not living there right now. Juan bring a guitar and we sat around singing. Noeme even did a Taro reading for each of us. Everybody tried to help translate for me so that I could be included in conversations. I so love being a Servas traveler. I will stay connected to Susanna. 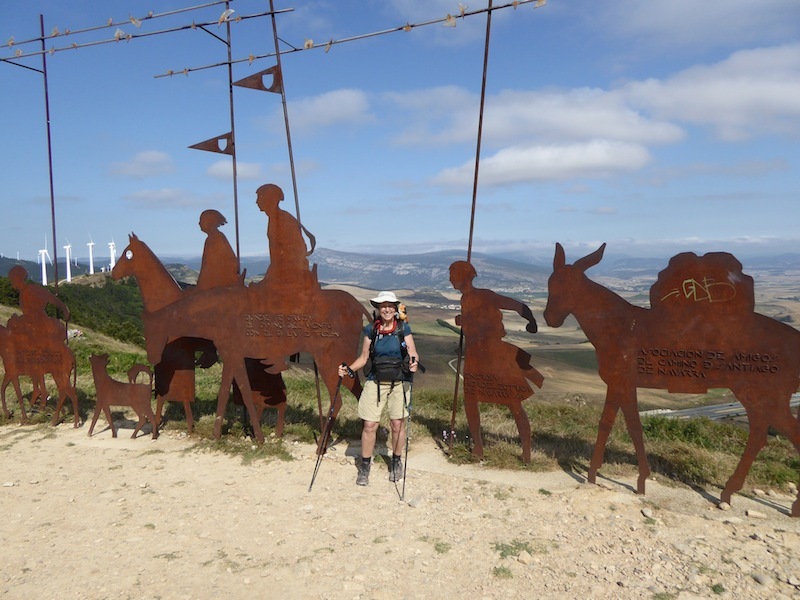 and the sculpture showing the history of pilgrims at Alto del Perdon. I loved seeing Marlin again. The sunflowers were just about done blooming, but I still loved the fields. The breeze was such a relief from the heat. I was so surprised to bump into Anna again and we had lunch. I really enjoy the times I am walking by myself. A small twist of my foot on the stones reminded me that the Camino is one step at a time and then I thought that actually life is one step at a time. How lucky for me that when I arrived (very tired after about 34 km) in Puenta de la Reina I got the last bed in the Jakue Albergue dormitory. Off to sleep on the top bunk. Categories: Camino Frances 2014 | Tags: 12th century home, Alto del Peron, Camino Frances 2014, El Camino, life change, Local Spanish people, sharing, Spain, spiritual, stories, walking | Permalink. So enjoying your travels. I feel like I am there along the way. Reminds me of my hiking in Switzerland over 13 days. I’m so glad you can send pics. Sounds like you’re having a wonderful time! Nancy, I always respected you, but this raises my respect for you a thousand fold. You make it all sound so easy, but I know it can’t be.